This post is all about Mei Li. 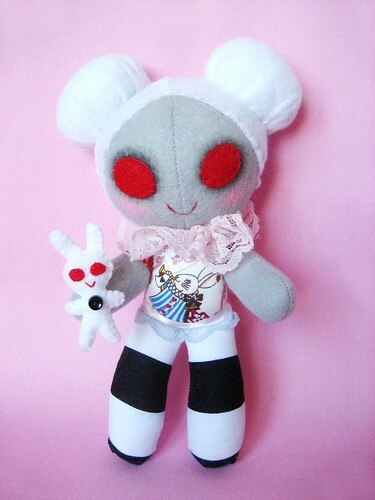 She is my Muse in plush form. I’ve been wanting to create my own personal muse for a while now, and this week I was finally able to bring my design to life! The first time I started thinking about what my own muse would look like is when I bought The Faerie’s Oracle tarot deck a couple of years ago (by one of my favourite artists Brian Froud). The deck comes with 66 cards that are beautifully illustrated, however, the zero card is completely blank. This card is called “The Guide”, and it is left blank with the intention of the owner completing it with their own personal muse. I never knew what to do with this card — what did my muse look like? What if I got it wrong? Looking back I’m not surprised that I didn’t know at that time. I would not be on my own personal art journey until a few years later, when my ex and I moved to the States. Then, just a couple of weeks ago when I was working on Plush Team’s favourite childhood plush project, an idea for a plush design popped out at me. I immediately had to draw her out. 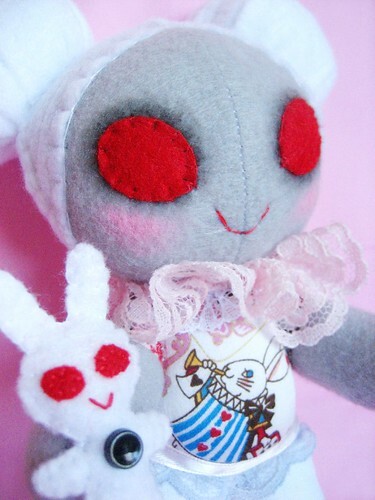 I knew that she was a white rabbit spirit girl, with white hair and grey skin. 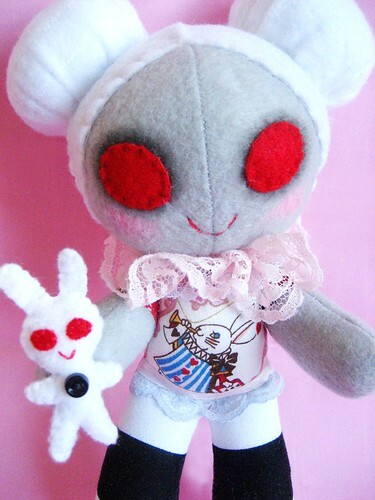 Mei Li represents my muse, a white rabbit zombie girl. Mei Li used to work in a turn-of-the-century travelling carnival. You know, the type with fire eaters, a freak show, exotic animals and trapeze acts. Her act involved acrobatics and white rabbits. Mei Li’s act was quite good, but the ringmaster kept pressuring her to make her performance more and more dangerous — for the enjoyment of the crowd (and to fill his pockets). Mei Li didn’t like the ringmaster too much, but unfortunately life as a carnie is limited, and it leaves a strange little girl with really no other options in life. Mei Li agreed to increase the risks in her act, but something went terribly wrong and suddenly Mei Li’s life was over. But for some reason, she remained in this world as a wandering ghostly zombie girl. 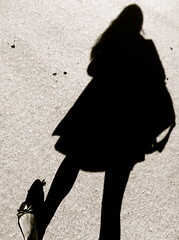 Mei Li took interest me when I was just a little girl. Maybe my clumsiness reminded her of herself, or my love of rabbits. Whatever the case, this strange little zombie girl has been my inspirational muse ever since. I used a new technique on her that I’ve been dying to use on a plushie! 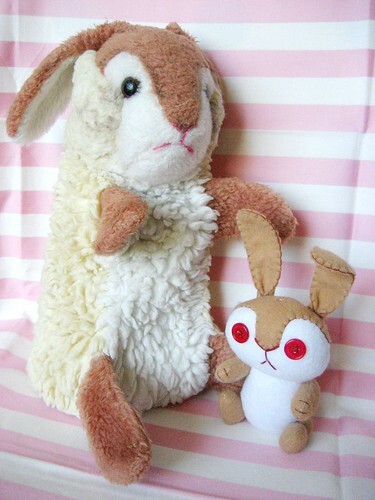 (Well, it’s not really new, but I haven’t used it on dolly plushies yet.) I gave her smokey eyes and blushed cheeks using pastels, and applyed them with q-tips. I’ve used this technique on my doll customs (you can really tell on my Holly). 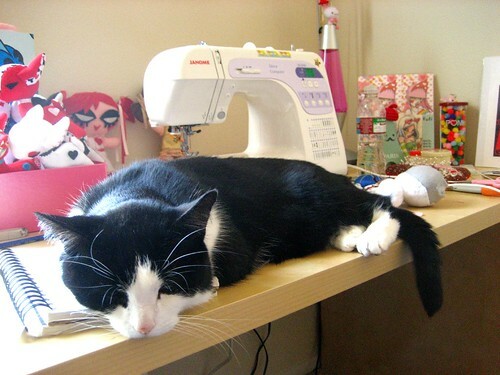 It gives it a really neat look that you can’t get with fabric or thread. This was my second project with Plush Team. We had to create a plushie based on our favourite childhood plush. This was a very fun challenge because it gave me a chance to pull out my old toys that have been stored away for far too long. Anyways, why don’t I show you what I made! 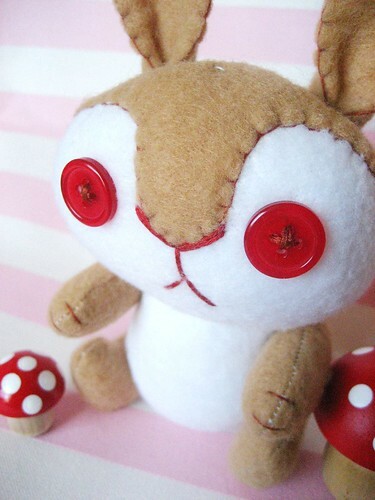 ^_^ This is Baby Rabbit. 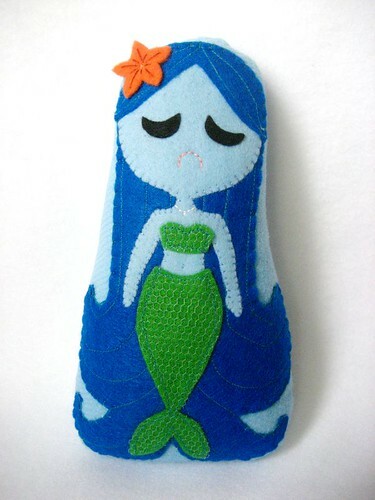 I tried to used the same colours on her body that were in the original plush, and I wanted to make her look handmade, so I added obvious stitching with dark brown thread where I could. I wanted the design of her face to be similar to the original, so I gave her a prominent nose, with a stitched nose and frowning mouth. 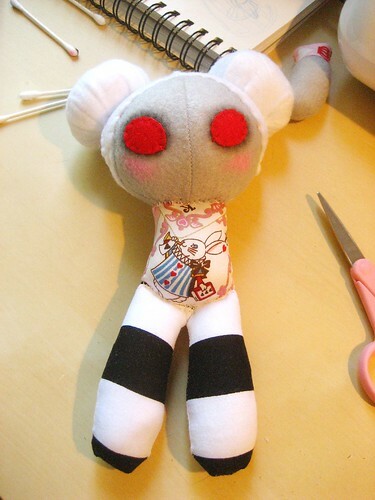 I didnt’t have eyes like the original plush has, but I thought these red button eyes were really cute for her. I thought about making her ears fall backwards behind her head, instead of forwards, but I like her ears perked up, and her ears are flexible enough that they can be folded backwards, stand up at attention, or folded down in a relaxed pose. She is now available for sale in my Etsy shop. Wooden mushrooms can be purchased at Craftsty’s shop. Plush Art Show: Crammed Organisms — book cover revealed! 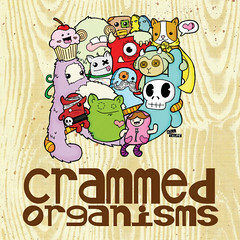 The book cover has been announced for the Crammed Organisms 2008 plush show! 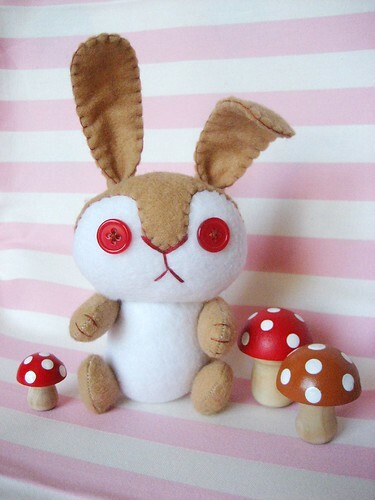 I think it’s so pretty with the wood grain background, and the super cute art by Kill Taupe. It will be a limited edition soft cover book of 5000, measuring 8×8 inches, with 130 colour pages. It will be available for pre-order at the end of May 2008 on the Crammed Organisms website. The first 500 pre-orders come with a limited edition print set, featuring 10 unique pieces from some of Crammed Organisms artists. Hooray, I can’t wait to see it! Area Thrifty One said that she really likes the darkness that fairytales have (I have to agree with her!). She loves The Little Mermaid sculpture in Copenhagen, because she looks so sad as she stares out at sea, since she is not really part of the land, and she is no longer a part of the sea. 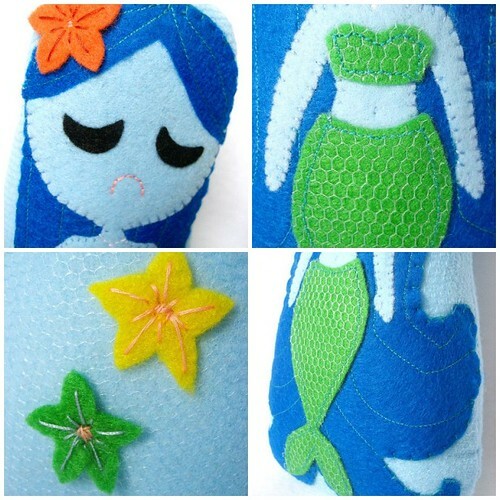 This photo shows the progress of The Little Mermaid plush. 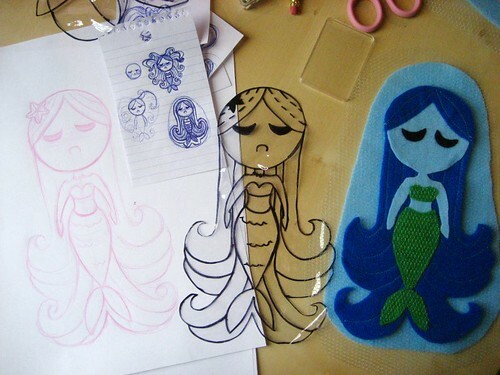 #1 – First I sketch out my plush designs on small scraps of paper. I decided on the one on the bottom right-hand corner. 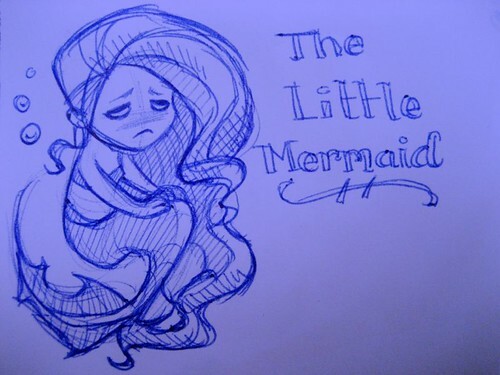 I liked the simplified shape, and how her hair looked like water. 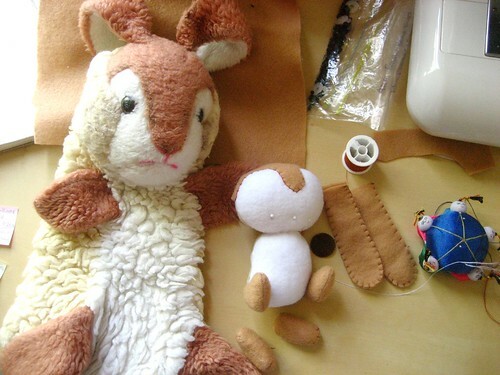 #2 – Next I sketched out the plush design in the actual size I wanted it to be. I tried to keep the shapes simplified. #3 – Then I cut my pattern out of plastic tablecloth (a little trick I learned from my Mom — it makes the pattern last a long time). This is my “master pattern”. From this, I made more patterns of just the skin, then the tail, the hair, etc. 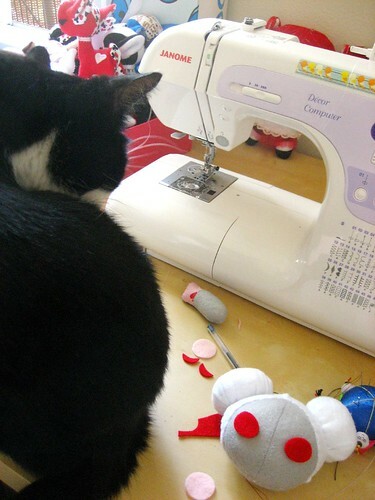 #4 – Then I cut out the felt, and place everything together. 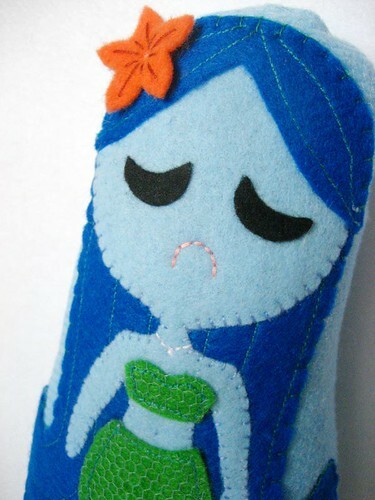 At this point I had already sewn blue thread into the hair.